NOTE: Grantland is owned by Disney. I knew something was up in the rubber stamp aisle of Michaels. I was out in the L.A. suburb of Glendale, shopping for craft supplies, because that’s apparently the stage I’m at in my life, when I started to feel as if I had wandered into a time loop. A song was following me around the store, coming from tinny iPhone speakers, repeating ad nauseam. I’d go down a few aisles and lose it, but inevitably it would find me again, the unmistakable conversational sing-songy cadence of a Broadway showtune coming back to haunt me. Please don’t shut me out again! It’s strange to hear part of a musical for the first time; even if you’re completely unfamiliar with the context, it’s somehow easy to immediately imagine what it’s like to be obsessed with it, at least for a former theater kid like myself. Whoever was behind the replay button on the mobile device had to be a young child; the need for endless repetition was unmistakable. When I finally found myself in the same aisle as the music, I indeed saw a 3- or 4-year-old girl in a stroller, gazing with wide, enraptured eyes into a smartphone. As if on cue, the song started up again. I shot a probably-irritated-looking glance in the direction of the music but instead caught the eye of her mom, who laughed apologetically and gave me a quick “Whatyagonnado?” smile. The song, as I later learned after Googling the lyrics I could remember, was the reprise of “For the First Time in Forever” from Frozen, an animated Disney film that I was vaguely aware of but figured was nothing I need concern myself with. I have a general aversion to animated films (yes, even most of your precious Pixar movies), and the Disney Princess empire gives me the creeps, especially when adults my age still wax nostalgic about it. Like most children of the ’80s I could probably recite all of The Little Mermaid, Beauty and the Beast, and Aladdin back-to-back-to back, having spent much of my childhood watching them endlessly on repeat in the same fashion as my little stalker in Michaels, albeit without the aid of streaming media on mobile devices. But as a marketing scheme, and an overall state of mind, the well-documented problematic nature of Princess Mentality has always been something I’ve tried to keep my distance from, perhaps out of rebellion, perhaps because it once had its hooks in me in my softer-skulled days. Still, something about that little girl and her smartphone seemed so familiar to me, and I got the sense, moreso than any other children’s film that’s been released in the last decade, that Frozen was doing something to little girls’ brains not unlike what Ariel and Belle had done to mine at that age. I wanted to know what that was, and if it was different somehow, and if it was a good thing or a bad thing. There was only one thing to do: against my better judgment, hold my nose and dive headfirst into Princess Culture. The Disney Princesses franchise is somewhere at the intersection between mash-up fanfic, the Marvel universe, and a fashion house. There are 11 officially recognized capital-P Princesses (Frozen’s Anna and Elsa are expected to be inducted into the ranks later this year), each of whom embody not only their respective mythologies, but a mode of being for young budding consumers to identify with. Are you a brainy Belle? A nature-loving Pocahontas? A fierce Merida? 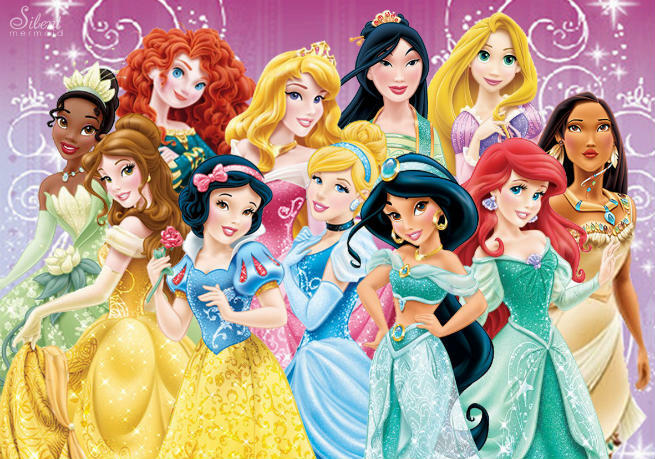 There is no narrative to the franchise; the princesses never have out-of-canon adventures with each other — in fact, Mooney has specified that they never make eye contact with each other in the group shots that adorn the licensed franchise products, so as not to upset the Princess space-time continuum. The campaign rolled out during a near death rattle for Disney animation, with the output of precocious little cousin Pixar eclipsing it both critically and commercially. The studio had veered away from the traditional myths and fairy tales that had brought it untold success in the ’90s Renaissance; the last real “princess” movie had been 1998’s Mulan. Its post-2000 output, with the exception of the (wonderful, underrated) Lilo & Stitch, had been a string of financial failures, from Atlantis: The Lost Empire to Brother Bear. Disney shuttered its hand-drawn animation studio in 2003 right before the release of the box-office flop Home on the Range, a musical about cows that was to be its last feature. Mooney’s experience at the ice show and the eventual wild success of the Disney Princesses brand were proof that even in the absence of new heroines, children (and their parents) were still seeking out the pretty comforts of princesses from before their time; that there was something timelessly appealing about a beautiful girl who gets to wear a magical dress and marry a prince. While Pixar’s progressive, four-quadrant, gender-neutral animated adventures ruled the box office, there was an entire generation of kids leapfrogging past the tried-and-true joys of heteronormative wish fulfillment. (Many people would argue that has been a very positive cultural development.) For nearly a decade, before the resurrection of Disney Animation Studios and the release of 2009’s The Princess and the Frog (notable for being the first Disney film to feature an African American princess), Disney’s princess era lay dormant in terms of film output; but as far as consumer products were concerned, it was more than willing to cash in on the nostalgia. The franchise takes up a good amount of real estate in any Disney store, many of the products not featuring one specific princess but all of them together, as if to emphasize the State of Being a Princess over the individual characters themselves. Which immediately raises the question: What does it mean to be a princess, both as a character and for a young person emulating one or all of those characters? It doesn’t necessarily require royal blood; several of the 11 merely married into royalty, representing the more aspirational aspect of the brand. Being a princess is less about a title and more about one’s singularity in one’s environment; she is the special girl, the one who rebelled against her community or was an exception to a societal rule. (Looking back, it occurred to me how many of the princesses’ stories rely heavily on their statuses as outsiders. The opening number of Beauty and the Beast is literally about how weird Belle is.) A princess has no peers, a princess does not make eye contact with the other princesses in the vicinity. Disney is a brand that encourages wishes and sells dreams; the princess, beaming in her new, updated dress, is that dream’s success story. I decided that if I was going to see Frozen and surrender myself to its princessy magic, I would make a day of it. I rolled into an 11 a.m. showing at the AMC multiplex in Downtown Disney, the outdoor shopping plaza/entertainment complex adjacent to the Disneyland Resort in Anaheim. The film had been out for more than a month at that point, and I counted about 20 people in the audience, most under the age of 10 and most, as it became apparent to me from the little voices singing and speaking along throughout the film, there for their third or fourth time. Against my expectations, I was utterly won over by Frozen. Despite its expertly catchy songs (the soundtrack, cowritten by husband and wife team Robert Lopez and Kristen Anderson-Lopez, recently dethroned Queen Yoncé on the Billboard charts) and au courant turns of phrase (“That’s a thing?” a character asks at one point), there’s something refreshingly unambitious about it; it is very content to be a film about princesses and castles and magical curses, albeit with a few genuinely shocking and brilliantly modern twists up its sleeve. In the interest of not spoiling too much, I’ll focus on the one twist that’s apparent from the poster: Frozen is the first Disney princess twofer, offering not one but two big-eyed, tiny-waisted heroines for this generation of 6-year-olds to become enamored with. While this just may seem like smart marketing, it also allows the film’s story to explore dynamics previously unavailable to its forebears. Rather than tell another story about the One Special Girl who has animal sidekicks instead of human peers and follows a linear progression toward a male counterpart, Frozen is about the relationship between two sisters. The central question is not whether Anna or Elsa will find men to marry (they’re born princesses and live in a giant Norwegian castle nestled among the fjords, so lifestyle aspirations are a nonissue here), but whether they can save their own strained relationship. It’s not just bucking tradition by featuring strong females, but by focusing on strong female relationships. I left the theater a convert, the Idina Menzel showstopper “Let It Go” suctioned to my brain, where it would stay for the rest of the week, but I was not about to leave it at that. I walked out of Downtown Disney and headed straight for the Magic Kingdom. 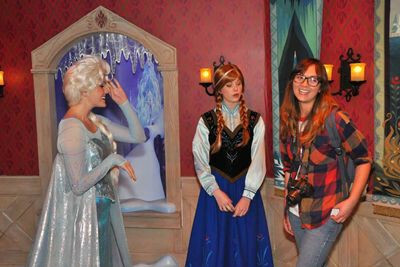 It was time to meet Anna and Elsa, my new role models, in person. “Hi, princess,” the greeter said as I passed through the turnstile of the Happiest Place on Earth. Going to Disneyland is always a little bit like going to a foreign country, with strange customs and greetings and a lousy exchange rate. I was headed for Fantasyland, not my favorite Land by a long shot, but the temporary home of the “Frozen Royal Reception,” a meet-and-greet photo-op station squeezed in next to Pinocchio’s Daring Journey. Because of the frustratingly vague language on the Disneyland website, I was not exactly sure what to expect, but I figured it was going to be key to my pursuit of the ultimate Frozen experience. For nearly two hours I waited in a coiled, crawling queue, surrounded on all sides by children in varying states of Frozen and/or princess attire. Disney resorts offer varying levels of Princess Experiences for a fee, going all the way up to the “Castle Package,” which includes a complete princess makeover, gown, and photoshoot for $194.95. The family in front of me had opted for this treatment for their twin girls and didn’t hesitate to tell other parents what a good decision it had been. Many of the parents spoke to each other, good-naturedly comparing stories with fellow veterans of war. Nobody spoke to me, partly because I was the only one without a kid, and partly because I was keeping my head down in an effort to not be seen in line for a Frozen photo op. All the while I wondered if/how the kids around me would eventually grow out of and process this all-consuming obsession as adults. Would they get wasted on pomtinis and belt out a wobbly rendition of “Let It Go” at karaoke? Would they be better prepared for IRL Prince Hanses? Why had both myself and these girls more than two decades younger than me been so profoundly affected by a company peddling stories about girls in dresses? If there was no Disney, would we invent our own pretty heroines, like the girls at the ice rink with their homemade costumes? Why couldn’t I get “For the First Time in Forever” out of my head? I marinated in this reverie until it was finally my turn, and a park employee ushered me into the little snow-covered cottage. At the other end of the room, opposite a table laid out with tea and cookies, were Anna and Elsa, or rather, two actresses who looked to be not much younger than me, dressed as Anna and Elsa. I immediately felt deeply ashamed, regretting the past two hours in line, feeling as though I had crashed a party that wasn’t for me, broken a spell meant for someone else. I shuffled up in my flannel and Kirin Beer ringer tee, avoiding eye contact with both of them. “What brings you to our kingdom today?” Elsa asked me. “Just, y’know, life!” I answered with automatic deflective irony. I glanced at Anna just long enough to see her barely masked annoyance with me. “I’m just a big fan of both of you guys,” I added, trying to sound genuine and wondering if that was even within my capability. I bolted out of the cottage so quickly I can barely remember leaving. I had cringed being called “princess” at the entrance; holding court with two honey-voiced actresses in wigs and crowns made me want to crawl out of my skin and die. I didn’t want anybody to talk to me like I was a child, I didn’t want anyone to think for even a moment that I wanted the same things that children want. I didn’t want to be the mom in the Disneyland commercial with the mermaid fantasy. Maybe I had had enough royalty and magic for one day. I had my fun playing tourist in Fantasyland, but it was time to get back to my level, to a more meritocratic power structure, a culture that values science and innovation over backward traditions. I headed for Tomorrowland. Will Fox Actually Blow Up Pilot Season This Time?